I’m finding that my time management skills are lacking a bit these days. Maybe it’s my tendency to bounce between many things at once instead of focusing on one task, or maybe it’s that things take longer than I think they should and I set unrealistic goals. Either way, I’ve been struggling for the last several days and am a bit worried as I watch my to-do list grow longer and longer. One thing I have to remind myself is that when starting anything new, there’s always an adjustment period. Since I haven’t had to deal with deadlines and editors before now, this is all new territory. With my blog, I set my own deadlines and am my own editor. And that has made me incredibly lazy. If I didn’t feel like it, I didn’t have to do it. Now that I’m actually getting paid to do it for someone else, there’s this funny little thing about them actually wanting you to do the work…on time. It’s a cruel world, isn’t it? My fingers are crossed that this will all get easier and soon it will become second-nature to dream up articles and submit pitches, then actually do the cooking, the photographing, the writing and ultimately submit something with the proper format, hopefully error-free and up-to-snuff. So far, I’ve got five under my belt and even the fifth one felt easier, which gives me hope that in another month all this angst will be for naught. As things get easier and I get more practice, I know my time management skills will come back, my focus will sharpen, and I’ll be able to check items off my to-do list quicker. I CANNOT WAIT. In the meantime, I’ll distract myself with chicken wings. 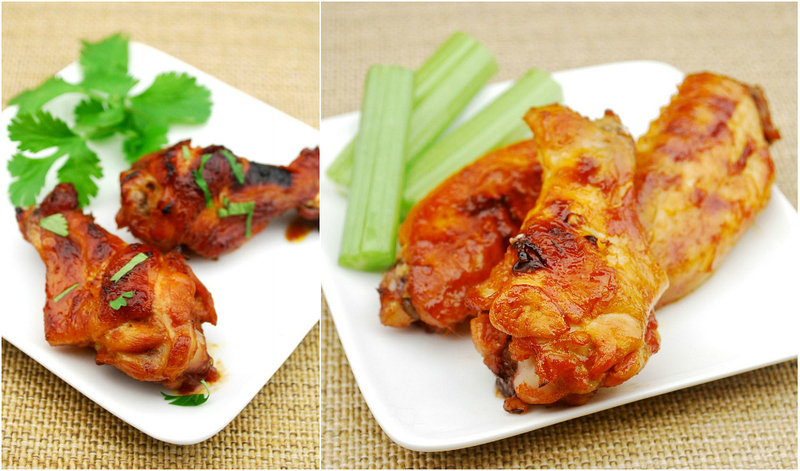 Super Bowl is just around the corner and chicken wings are a must-have dish at any football party. And, just in case you have picky eaters, I’m giving you three options to please them all: sweet and spicy, tangy with a kick, and fiery hot. Check out the recipes here, and get the wet-naps ready. That looks amazing! Great pics and blog post too! Oh man, now I'm craving spicy chicken wings, STAT. Looks fantastic! Great photo; my husband has been asking for chicken wings and these would make him very happy; thank you. If the wings are half as good as the photos (and I'm sure they are), this is all one needs to enjoy the game. Excellent! Oh now these are just beautiful! One of my favorite things to eat! I agree w/the whole "adjustment period" thing...in this crazy, busy world it's hard to manage our time...you seem to have figured it out though Karen! Thanks for sharing that. Your wings look great. I can not get enough of wings. Love them anyway I can get them. I have a stack of wing recipes just waiting to try out. One of my favorites has become Piri-piri chicken wings, which uses a Portuguese hot sauce. Good stuff. Yum! Perfect for the playoff games this weekend! Awesome recipes. Good luck with your writing too I'm sure you'll get the hang of it in no time! YUM!!! These are so going on my super bowl food list! Wings are one of my top ten favorite foods. I usually have a crappy appetite but put wings in front of me and I can eat my weight in them. These all look fantastic! Is it possible to get enough wings? I don't think so but I'm always ready to give it another try. Hope things get easier for you. I'm so envious that you're "living the dream"! I've wanted to be a full-time writer for a while, and it's wonderful that you're getting the opportunity! I am sure it will get easier as you get into a groove and figure out a routine/environment that works best for you and your writing. Be forgiving to yourself and let your gut tell you what's working and what's not. Hey Karen, did I miss that you were doing recipe development/writing full time? If so, I am sorry! Nice work though...and great wings! I seem to have also lost total control of my exceptional time management skills this month - maybe taken on too much - maybe just getting slow (sure hope not)! The wings look delectable. I do freelance writing and editing and there is always an incredible amount of stress involved with each contract IMHO as the deadlines consistently seem unreasonable with the writing or work that is expected to be done by the due date. I like incubation time. Never get it. I saw your blog post and now all I've been thinking about are WINGS, WINGS, WINGS! I'm not even pregnant and I've got such a craving for them! Thanks, I guess...now I gotta go make them. :) Too bad I can't just eat your picture!